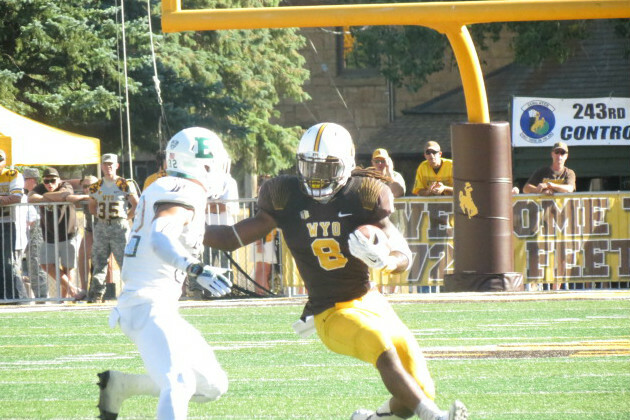 Last week was rough for Wyoming fans, not only the performance on the field but on the sports books as well. This week, the Cowboys head up to Pullman to take on Mike Leach’s always dangerous offense. That thought alone gives me the night sweats. I’ve been having the same recurring nightmare where our defense just keeps getting slashed and gashed each time they’re on the field. I try everything but it just seems to happen over and over and over again. The odds makers in Vegas, however, gave me a glimpse of hope to recapture some money this week. Since the formation of the P5 system, Wyoming has failed to put a W on the board against anybody from those conferences. They have fared much better against the spread. Since 2011, the Pokes have gone 4-2 against the spread when playing against power 5 opponents. As a matter of fact, we were set in a similar situation last year when we went on the road to Eugene and covered against a very powerful offense. That gives reason to hope. This year, the struggle has been defensively. Brian Hill came into his own again last week. Posting 242 yards on 21 carries, he had a phenomenal day on the ground. Shaun Wick also showed some improvement over week one. The biggest issue Wyoming will continue to have will be moving the ball through the air. The return of Cameron Coffman this week should help. Regardless, they should put some points on the board against WAZZU’s porous defense. I don’t think the Cowboys win this week. I like to be optimistic but they need to prove something to me. However, Washington State has been less than stellar. Given the improvement we saw from week one to week two and a changing offense, Bohl should focus on ball control. If we limit the huge plays, a King-Kong like “if” at this point, we can cover. My prediction? Cougars 48, Cowboys 27. The line is Washington State -24, I think we cover, albeit not by much. My record on locks of the week hasn’t been great, so I’m staying in conference. Number 21 Utah is traveling to Fresno to take on the Bulldogs. Utah’s defense is tremendously tough and have said they want to post a shut-out. Regardless of who lines up under center for the Utes, they’ll cover the 14 points they’re spotting Fresno State. WyoNationDotCom I would take the over of 64 instead of playing a team.